Photos are arranged from...Oldest Events to Newest Events. Here's a You Tube Video, filmed by a spectator at the parade. The music is over-dubbed by the spectator, who posted the video. Our band, the 79th Highlanders is featured first (for the first minute and 14 seconds-- from 0:00 to 1:14). 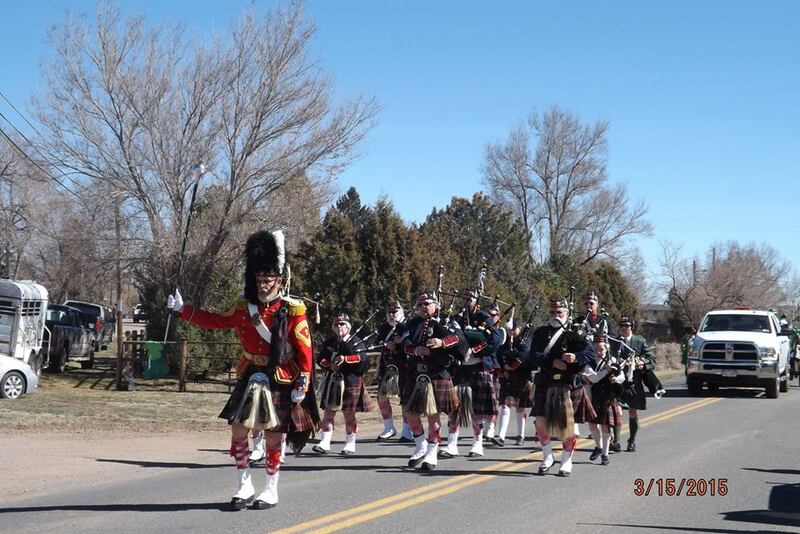 The other pipe band in the parade, The Pikes Peak Highlanders, is featured from 3:35 to 4:06. Memorial Park, Colorado Springs, Colorado. North Nevada Ave., Colorado Springs, Colorado. Casey Jones Park, Elizabeth, Colorado. "Best in the West" Parade at 10:00 a.m.
"Cody's Wild West" Show at 12:30 p.m.
Mulligans for Military Benefit Golf Tournament, Spring Valley Golf Course, Elizabeth, CO -- 8-24-2015 starting at 7:00 a.m.
Our thanks to the Rocky Mountain Highland Dancers for helping us at this great performance. This last weekend (well, starting on Thursday, Sept. 10, and continuing thru Sunday, Sept. 13, 2015), we were part of Fort Lupton's Trapper Days Festival. The 79th Highlanders Living History Association and its pipe band had a fine time again at Fort Lupton Historical Park, on the northwest side of the City of Fort Lupton. Photos will be posted as soon as they're available. The Trapper Days Festival continues to grow, both in town (which we didn't do this time) and at the Historical Park and Rendezvous. The Rendezvous had around eighty tents, and the 79th Highlanders Encampment had four...and was now further south. On Friday, 79th members present had a steady stream of visitors, since the Ft. Lupton schools brought over 300 elementary school students to see the rebuilt Fort Lancaster (named after Lancaster Lupton, the retired army officer who established the fort in the early 1830s) and everything around it. On Saturday, there were six attending pipers (P/Sgt. Tom Soto had to be elsewhere doing a gig, and none of the photos shows Piper Karen Henwood, who joined us for a performance back at the Rendezvous). The band performed at several of the camps in the Rendezvous area, then performed for the Buffalo Soldiers (after their fine show), and finally performed in the Fort. It was another hot weekend (like last year), which made the event a bit less fun--we remember the first couple of years we were involved where it was a bit less warm--we even did the parade then in our blue wool jackets. We hope to have photos from the Calhan Homecoming Parade (Sat., Sept. 26, 2015) soon. These photos were taken by Ed Goodrich, one of our helpful volunteer staff photographers. The 79th Highlanders appreciates that family members agree to share their photos. Ray Brown, of the Buffalo Soldiers of the American West. Here is a Video on Facebook of the event, from Capt. Ray Brown of the Buffalo Soldiers. Colorado Public Radio (KCFR 90.1 FM, in Denver) reported on the event and did a story on these Civil War veterans on the station's radio program called "Colorado Matters." This is a link to the CPR (Colorado Public Radio) website.